In late January, Chilean President Michelle Bachelet signed into law the most significant educational reform the country has seen in 30 years. Enacted after an eight-month legislative battle, the new law will gradually ban profits, tuition fees and selective admissions practices in privately owned primary and secondary schools that receive state subsidies. As anticipated, the protracted legislative battle over the New Majority’s education reform galvanized strong opposition from conservative sectors. 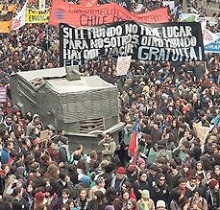 But dissent has also come from less expected quarters: the highly organized Chilean student movement. “This is not the reform we mobilized for,” proclaimed the University of Chile Student Federation (FECH), which spearheaded the massive 2011–13 demonstrations that catalyzed popular demands for education reform and paved the way for the New Majority’s electoral victory. “We have wasted a historic opportunity for educational reform, and also deeply damaged our democracy,” said Gabriel Boric, one of four student leaders elected to Congress in 2013 (who, nevertheless, voted for the reform). To appreciate these surprisingly dissident perspectives, the new education reforms must be viewed in a broader historical context. The wholesale conversion of Chile’s system of universal free public education to a privatized, deregulated, demand-driven scheme, which began under Pinochet, was consolidated by subsequent democratic regimes. At the primary and secondary level, public schools have been systematically undermined by a municipalization strategy that generates widely disparate funding levels between jurisdictions, and by the creation of private schools that compete with public ones for state voucher subsidies. Today, as resource-starved public schools continue to decline in quality, only 37 percent of Chilean students are enrolled in them (down from 80 percent in 1980). Private schools with state subsidies (like U.S. charter schools) are the fastest growing sector, representing 56 percent of enrollment. Of these, one-third are nonprofit (primarily owned by religious institutions) and two-thirds are for-profit. The remaining 7 percent are private with no state subsidies. Most for-profit subsidized schools also charge tuition, and select (and retain) students based on their socioeconomic status, test scores and performance. As a result, each student buys the education that he or she can afford, and 44 percent of students — largely from poor neighborhoods and villages — do not complete high school. Still, even in the most selective institutions, students test well below average for the 34 developed nations that belong to the Organization for Economic Cooperation and Development (OECD), due to the lack of quality control of schools, teachers and teacher training. At the higher education level, 80 percent of Chilean students now attend private universities or technical institutes. These schools are the most expensive in the world, relative to per capita income. Students pay tuition at public universities, too, an unusual situation in Latin America. While Chilean universities are technically required to operate on a nonprofit basis, recent investigations have documented illegal strategies used to divert funds for private gain, including service contracts and land or infrastructure leases with related for-profit entities. Universities are also highly segregated, with admission exams disadvantaging poor students from lower-quality high schools and channeling them to “storefront” institutes, where roughly half drop out with high debt burdens. Top-ranked schools, including state-subsidized public universities, are available only to elite students. The result, according to Educación 2020, is a system of “educational apartheid” that is among the worst in the world. It reinforces and reproduces inequality in a country that has the most unequal income distribution among OECD member states (as well as the highest per capita income in Latin America). Bachelet’s reforms, which seek to decommodify privatized primary and secondary education, are aimed at one portion of this repressive system. They will require owners of for-profit elementary and high schools to convert to nonprofit status and to admit students by lottery instead of discriminatory selection. Tuition fees will gradually be replaced by increased state subsidies. Students say the reforms don’t go far enough and may fall short even in meeting their stated objective. They point to loopholes that will allow “flagship” schools to maintain selective admissions for up to 30 percent of their enrollment. Nonprofit schools can also retain transitional leasing arrangements with for-profit landlords, legitimizing continuing profits within the primary and secondary education system through the same subterfuges used by private universities. Students also criticize Bachelet’s program for failing to restructure the decimated municipal public school system; improve teacher training, salaries and quality control of schools; or address their key demand for free and universal higher education. Bachelet has promised additional legislation this year to deal with these issues, including free universal education by 2020, though few details are forthcoming as of yet. More fundamentally, the FECH and Gabriel Boric argued that the reforms passed and contemplated to date do not break with the logic of the neoliberal education system and may even serve to reinforce it. By enshrining the voucher system, they contend, the reforms will continue the competition for enrollment and resources between public and private schools that has destroyed quality public education. Indeed, Bachelet has marketed the current education reform, in part, as a project to enhance “school choice” by removing cost and selectivity barriers — even though the public sector, under current conditions, can’t provide a competitive alternative. What’s needed, according to the FECH, is a complete re-nationalization and return of education to the public sector, with funding based on institutional need rather than demand. This contrasts sharply with the views of Bachelet and Educación 2020, who envision the end result of Chile’s reforms more as a mixed public-private nonprofit system, similar to the Netherlands or Belgium, that remains demand-driven. Student leader-turned-legislator Camila Vallejo has taken a more pragmatic stance, endorsing Bachelet’s gradualist program as the most practical way to eliminate profits in education without a massive expenditure of state resources. Vallejo, who will chair the education commission in the Chamber of Deputies this year, will be in a key position to shape the New Majority’s future education agenda. The upcoming legislative battle over higher education is expected to be much more contentious than last year’s struggle. Its outcome will be strongly influenced by the student movement’s continuing ability to articulate and link popular demands to a broader structural analysis, using the creative tactics (from school takeovers to “kiss-ins”) that have mobilized hundreds of thousands in the past. Currently, the student movement appears to be at a crossroads. While massive demonstrations continued last year after Bachelet’s proposed reforms were announced, the passage of the bill has demobilized some sectors and created new organizational challenges. The movement encompasses diverse political tendencies, and continually struggles to define its complex relationship to electoral politics. Recent elections have split the student leadership between left- (FECH) and right-wing (Catholic University) factions, with the latter opposed to nationalization of all universities. 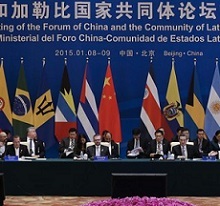 On the other hand, FECH, the largest organization, has successfully united its three major political constituencies and is well positioned to lead the upcoming battles of 2015 (dubbed by FECH the “Year of Higher Education”). 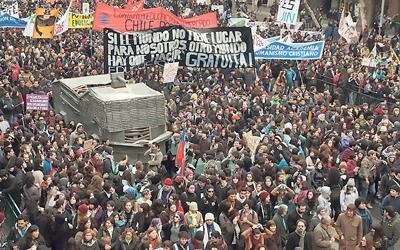 While Chilean students may be loathe to claim Bachelet’s reforms as a partial victory, their experience is teaching the world how mass popular movements can transform state policy — even if they can’t win everything at once — and how difficult it is to truly dismantle the entrenched neoliberal educational model. This article is a joint publication of The Indypendent and NACLA. Emily Achtenberg is an urban planner and the author of NACLA’s Rebel Currents blog, covering Latin American social movements and progressive governments.